Wondering how to get involved with the competitive scene for Legion? Let's look at how FFG structures their events, vis a vis the upcoming Las Vegas Open. UPDATE 1/31/19: Two days after I posted this article, predictably, FFG released a massive update to their OP structure, despite a rep from Asmodee affirming the validity of the image guide over the weekend. Basically the first half of this article is now obsolete. But the LVO stuff is still good. Enjoy. 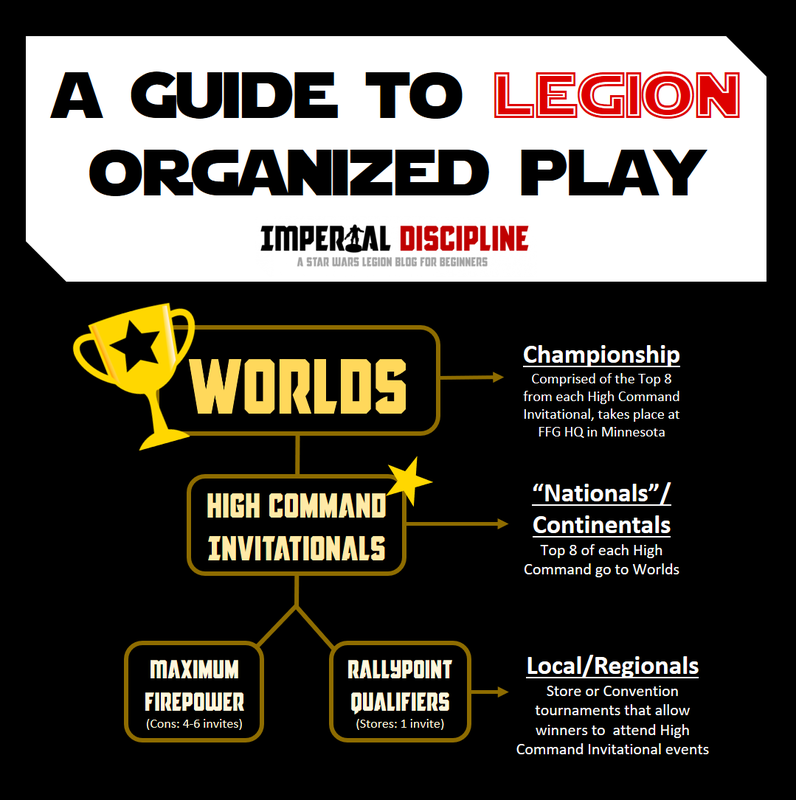 And while FFG has written a few articles laying out exactly how they want Legion’s competitive side to look, the complete structure and process by which a spunky farmboy from some backwater planet can from from their local meta to WORLD CHAMPION can still be a little confusing. So first, we’ll lay out exactly what it takes to go from zero to hero through visual and written explanations. Then, we’ll take a look at what you can expect from a high quality Legion tournament with a primer for the upcoming Las Vegas Open. Place high enough in one of those competitions to earn a coveted invitation to a High Command Invitational. Rallypoint Qualifiers will usually give out just 1 invitation, while Maximum Firepower events will give out around 4. Step 2: Once you’ve earned your spot in a High Command Invitational (which essentially function like National or Continental championship), place in the top 8 to earn a spot at the World Championship. Step 3: Travel to and win the World Championship! Obviously, that last step is easier said than done. But I believe in you, Commander. We are currently in season one of Legion Organized Play (OP). During this initial season, it’s important to note that the full OP plan is not in place and the structure is heavily skewed towards American competitions. For instance, Rallypoint Qualifiers do not yet exist and, as we’ll discuss, only America has a true High Command event. A funneling system, however, is somewhat in place for this season. In the United States, local Rallypoint Qualifiers and bigger Maximum Firepower Qualifiers like the Las Vegas Open, Michigan GT, the Spanish and French Nationals, and Adepticon will each send a set number of players (presumably 1 for the former, 4-6 for the latter) to the High Command Invitational at Adepticon in late March. This High Command event takes place shortly after’s Adepticon’s “last chance” Max Firepower event. During that High Command Invitational at Adepticon, 32 players will vie for 8 spots at Worlds. 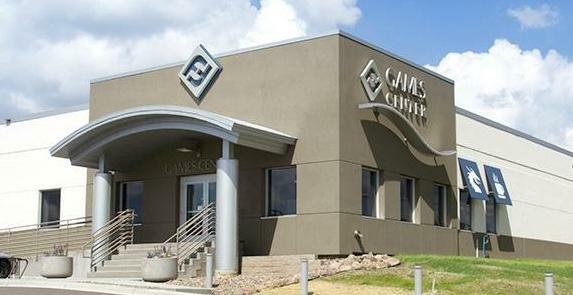 This first season will end with the World Championships in June 2019 at FFG HQ in Minnesota (US). While this final seasonal tournament will be open to all High Command top 8 winners in the future, this year Worlds will only feature the Top 8 from Adepticon’s High Command. So the path for season one is clear: place high enough at a Max Firepower event to make it to the Adepticon High Command, then place top 8 there for a shot at Worlds. Once season two has begun post-Worlds, the full Legion OP structure will be in effect and we’ll see a serious spike in the competitive opportunities available to all Legion players, starting with the local Rallypoint Qualifiers. Although we’re still in the dark in America as to which stores will have the opportunity to host an event, the Asmodee UK website had already begun posting such locations in early October 2018 (which you can see here). Of course, all of this is subject to change in future seasons. And while the next, full competitive season sure looks great, there’s still plenty of Legion left to be played this season. Let’s take a look at the next big tournament in America, the Las Vegas Open. Nestled within the glitz and glamor of the Nar Shaddaa Las Vegas Strip at Bally’s Casino, the upcoming Las Vegas Open (LVO) will take place from February 8th to February 10th and feature tournaments and seminars for all of the big names in tabletop gaming, including Blood Bowl, Warhammer, X-Wing, and of course Legion. Specifically, the Legion tournament takes place on Friday, February 8th. 64 Legion players will vie for 6 High Command Invitational spots over the course of the day, with notable community names sprinkled throughout the event: LJ Peña (aka TalkPolite) of Impact X and Invader League fame will primarily be hosting the event, Kyle Dornbos (aka Orkimedes) will be one of the judges (alongside Jeremiah, and Brendon Franz as Marshal), and of course many others will be competing for their invitation. But the six invitations are not the only thing players will be competing for. Far from it! Plus a whole host of other goodies like holo tables, custom painted minis, lanyards, and more! There might even be a few sets of Imperial Discipline alternate art command cards floating around. While not every tournament will be so stacked with goodies, it certainly makes sense that LVO is. What is Las Vegas without a bit of excess? Some of the very cool swag they’ll have at LVO! So what if you’ve never been to a tabletop tournament before? What should you bring, and what should you expect? Let’s break down a few things you’ll want to know and keep in mind leading up to your first tournament. But first, our friends over at Impact X wrote a great primer on what to expect. Consider reading that before scrying over the rest of this piece, as Nick Freeman is a seasoned pro for this kind of event. I can’t emphasize bringing your own water/snacks enough! Take care of yourself – no matter what you’re going to be exhausted by the end of the day, and that granola bar and bottle of water may genuinely be the difference between triumph and defeat in your last match. I personally need a caffeine pick-me-up, and usually like to have one energy drink in the afternoon to keep me sharp. YMMV. Consider also bringing a portable charger for your phone, just in case. If you get a bye, you’ll want to have entertainment options! The LVO guidelines specifically state that there is not a painting requirement for their tournament, meaning your miniatures just need to be assembled and on an appropriate base. It’s worth noting that color requirements (e.g. a minimum of three colors across your army) are not unheard of in tabletop wargaming scenes. You’ll also want to bring three printed copies of your list and two barricades. Printed lists are always, always a good idea! I’d personally recommend bringing one for yourself, one for the judges, and one for each opponent you plan to face for that day (so in this case, a total of 6-7). Imperial Discipline has got plenty of posts about competitive list-building on file already, but you should just bring what you’re most comfortable with. Don’t be tempted to change your army at the last minute because someone says your list isn’t 100% effectual or efficient. A recently announced map for LVO players. You’re in the middle of a game, and something fishy is happening on the other side of the table. Something doesn’t quite fit with your understanding of the rules. You don’t want to be rude, but you want to make sure everything is above board. You’ve tried to speak with your opponent first but the two of you are unable to come to an agreement. First, you’ll talk to one of the two LVO judges. Maybe at your local tournament there’s just one, or at bigger events even more! As mentioned before, at LVO specifically these will be Kyle and Jeremiah. They’ll help you and your opponent make an informed ruling. If one of you is unhappy with their decision, you can appeal to the marshal. At LVO, this will be Brendon. He’s the final say on rulings, and has a deep understanding of the game’s rulings and mechanics. So at any point during your game there are two levels of authority to appeal to, just to make sure that everything is being played fairly. When at all possible, talk things through with your opponent first – only go to the judges as a last-case scenario. Remember, too, to always consider the human. It is extremely unlikely that you meet anyone who is willfully trying to break rules for a competitive advantage – I’m quite spacy myself and will often make mistakes in high-pressure situations. It happens! If you are the one making the mistake, apologize. If you are on the other side of a mistake, accept the apology and move on. Practice good sportsmanship. And now that I’m off my soapbox, let’s take a look at one final thing: the tournament’s competitive structure. One of the previewed maps – Scarif! LVO will be running with a four round Swiss followed by a cut to the Top 12. Let’s break down exactly what that means, because this is a highly standard format and definitely something you might expect out of any competitive tournament you visit. Each of these rounds will be 2 hours and 15 minutes, with an hour long lunch break and about 15 minutes in between matches to stretch your legs. Rounds 2-4: Players are matched by overall Win/Loss record (approximately, so someone at 2-1 may be matched with someone at 1-2 – this process is called pairing up/down). Top 12 Cut: After four rounds of play, the top 12 players (as determined by W/L record, strength of schedule, and “Extended SoS” [which is a level or two deeper than just pure strength of schedule]) are brought into the final cut. Everyone else is free to go home or stay and spectate the final round. That’s a lot of Legion in one day already, so fortunately those lucky 12 individuals in the top cut will then face off against their opposite in the ranking (#1 with #12, #2 with #11, etc.) and the winner of each game will receive one of the six coveted invites to the High Command Invitational at Adepticon. So if you do well enough in the first four rounds, you’ll need only one more win in the Top 12 Cut to make it to High Command! Late next week we’ll eagerly be awaiting the results of the tournament – personally, I’m hoping for a double T-47 list to show the haters and win the whole damn thing. But even if you’re not attending LVO (and, sadly, I will not be either), I hope that this has you excited for the tournaments to come in the next season of Legion OP. Whether you’re a competitive-minded player or just enjoy making your minis look nice, you should definitely consider going to one just for the social aspect. It’s a lot of fun, and Legion has a great community. Until next time, happy tournament-ing, Commanders!